I just received a payment, now what? Congratulations! You just received your first payment through Ivy! Let's take a look at how to set things up. To transfer the payments to your account, you will need to click on the "Account Settings" gear on the left bar, where you can fill in your payment settings. Once you've filled everything, be sure to click on the "Verify My Account" at the top right of the screen, and your payments will be processed over the next 2 business days. And that's it! 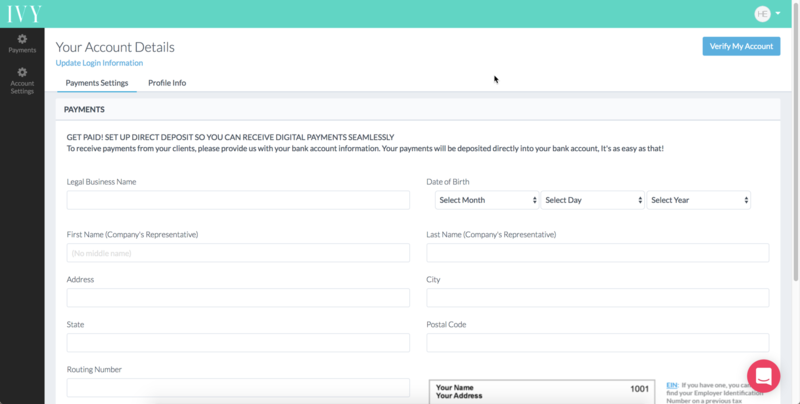 Now you can continue receiving payments from your customers directly within Ivy! Absolutely! Ivy works with Stripe, one of the top rated online payment systems in the world. That means that your payment information is 100% secure at all times, and you should feel comfortable receiving payments from your designers!